Two of our very dearest friends are having a baby in November – we couldn’t be happier for them! The baby shower was last weekend, and I knew I wanted to do something special for them. 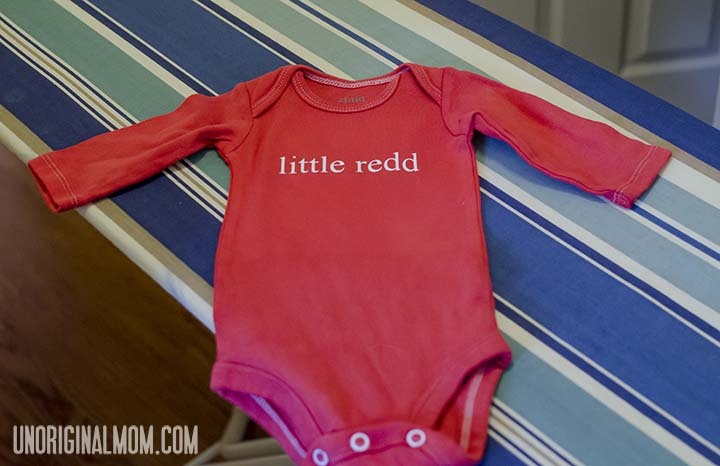 Their last name is Reddington, so I thought a making a “Little Redd” diy personalized onesie would be cute! They aren’t finding out the gender beforehand (woohoo Team Green! ), so I thought this would also be a great gender neutral gift for a baby girl or a baby boy. 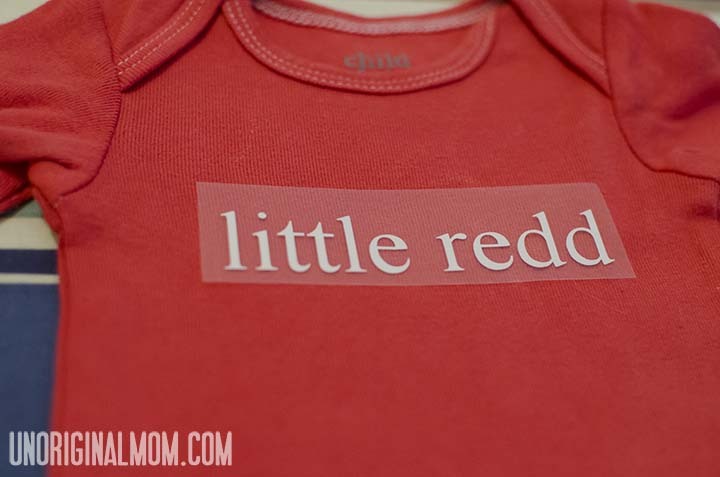 The first step was finding a plain red onesie …but I have NEVER seen a plain, solid colored onesie in a store, so I knew I’d have to make my own. But, that was no big deal since I had just dyed a onesie for my little girl’s first birthday outfit, so I knew it was easy! First I bought plain white onesies (I am a big fan of the Carter’s “Child of Mine” brand available at Walmart, I’ve found they are much better quality and a better fit than Gerber onesies) and washed/dried them. 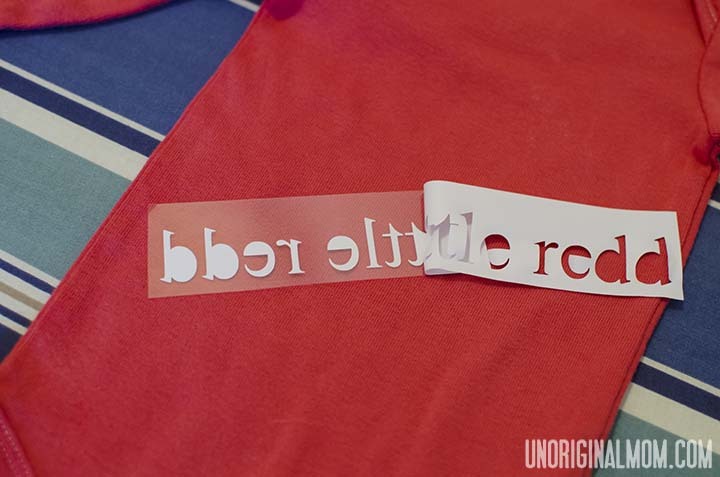 Then I used the RIT liquid dye color Scarlet and followed these instructions to dye the onesies in my washing machine. Using heat transfer vinyl that I bought from Pick Your Plum a few weeks ago, I cut the lettering for the onesie on my Silhouette. 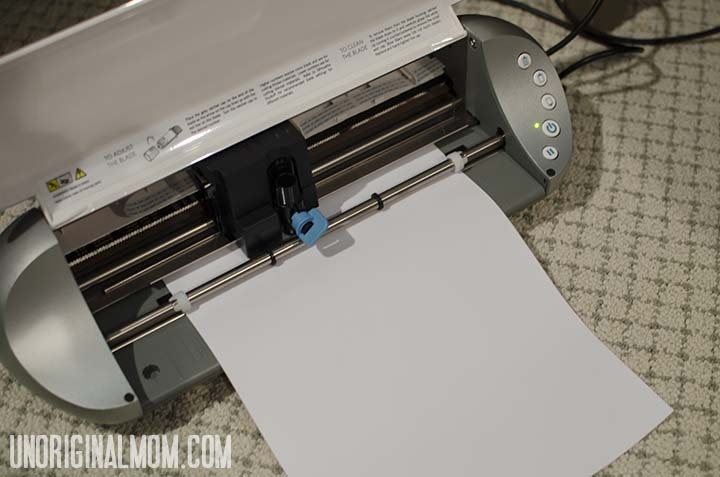 (Lauren at The Thinking Closet has a great step-by-step tutorial on how to cut and use HTV!) It is regular old Times New Roman font. and ironed it on! 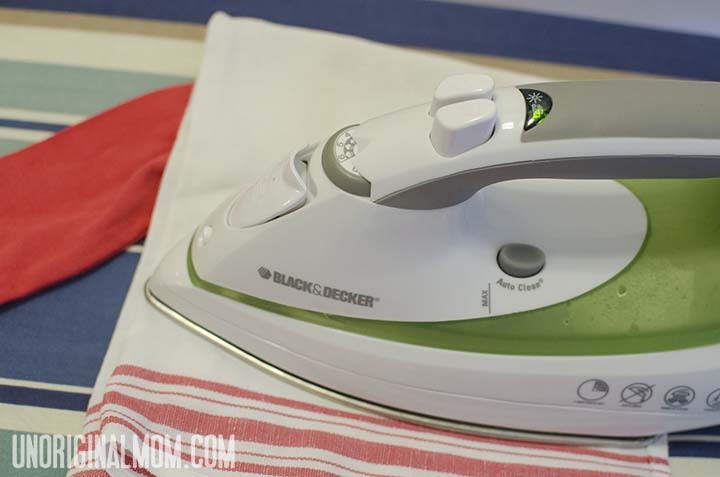 It took about 3-4 minutes of ironing to completely adhere it. I’ve never seen a onesie quite like this before…super cute! I love the red color. So bright n’ bold. I actually just got some RIT dye in aqua, so now I’m tempted to dye my own. Thanks for the tips and for the shout-out. You’re the best! Do iiiiit! I was going to do another set of onesies in teal, but I messed up the dye so it didn’t cover completely (my washer only has a 15 minute cycle so I had to go in every 10 minutes and re-set it to keep it from rinsing too early…I missed it and it rinsed too early, boo!). I was really excited about the color, though, so I may try it again sometime for something different! Meredith, I stumbled upon your blog since Annalynne linked to this post on FB. this was definitely the cutest & most original gift at the shower! loved it! I stumbled upon your site via Pinterest and got snagged by this adorable onesie! 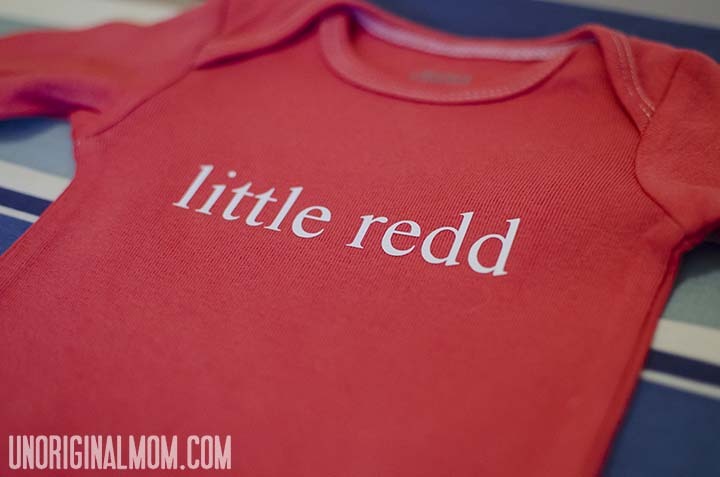 My fifth (and LAST) baby has red hair so I’m thinking she needs a “Little Red” shirt. :) I love your blog design and all of the fun DIY stuff I’ve added to my list this afternoon. So glad I found you! Hi Erin! Sounds perfect – congrats on your baby girl!! Thanks for your sweet words. Nice to “meet” you!